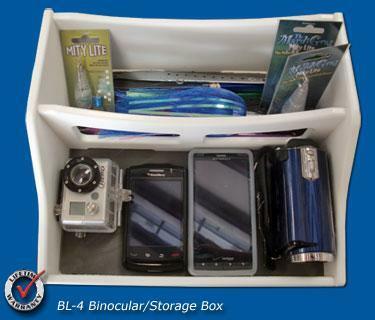 This larger version of our popular BL-2 binocular box was designed for our customers that required more storage for things like wallets, glasses, drinks, lures, binoculars, etc. 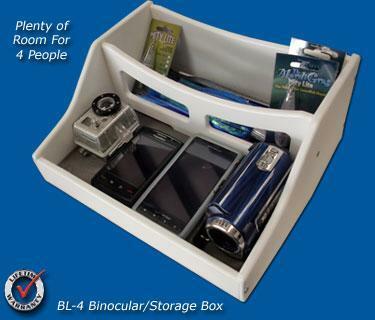 The BL-4 also gives you quick access to your still and video cameras. 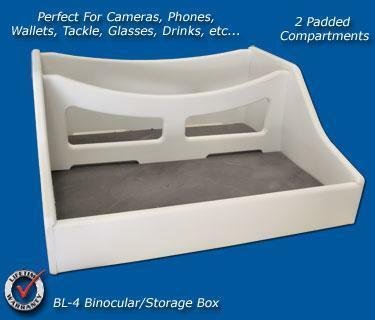 We use a closed cell foam in the bottom to help stop damage in bumpy conditions. 100% marine-grade polymer means a lifetime of use. Includes 4 suction cups. 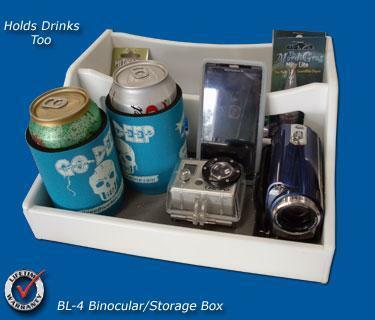 Size; 11 1/2" wide x 10 1/2" deep x 5" tall with 2 seperate compartments; back compartment measures 3 1/2" x 10 1/2" and front compartment measures 5 1/4" x 10 1/2"